Members of the UCSC men's tennis team will vie for the D-III title during the 2011 NCAA Men's Tennis Division III Championships. The first and second rounds of the regional playoffs will be held at UCSC. The campus will host the first and second rounds of the regional playoffs on Friday and Saturday, May 13 and 14. 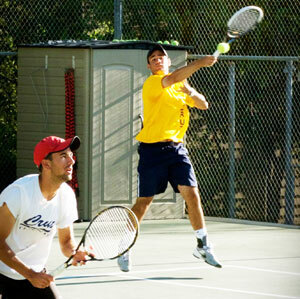 The UCSC men's tennis team (ranked No. 4 in the nation) has qualified for the playoffs and will play in the first match on Friday against Pomona Pitzer (ranked No. 7) at 10 a.m. The second match will be Claremont-Mudd-Scripps (ranked No. 3) against University of Texas--Tyler at 2 p.m. The winner of these two matches will advance to the second round and play each other on Saturday at 12 p.m.
All matches are on the East Tennis Courts at UCSC. Admission is free. Just identify yourself as a spectator for the tennis championships at the entrance to the East Field House complex. Come on out, support the Slugs, and watch some exciting tennis at the highest level! Click here for complete information and updates.